Opti Life Maxi Medium Adult Digestion is a specialized food for the digestive system sensitive of your dog. Opti Life Adult Digestion Medium & Maxi is a formula perfectly balanced, specially developed to meet all the nutritional needs of your dog if you have a sensitive digestive system. Opti Life Adult Digestion Medium & Maxi is a formula perfectly balanced, specially developed to meet all the nutritional needs of your dog if you have a sensitive digestive system. Opti Life Adult Digestion Medium & Maxi provides your dog all the necessary nutrients to get a healthy intestinal flora and prevent food intolerances. 73% of the proteins present are of animal origin (lamb). The animal proteins are tasty and are digested with ease, which allows the granules to be ingested quickly. It is a formula without gluten on the basis of rice as the only grain, which guarantees an easy digestion, even in the case of the puppies. Does not contain corn or wheat to help avoid food intolerances. The component star is the salmon oil (omega-3 fatty acids), which guarantees a healthy skin and a shiny coat. In addition, it contains fiber and nutritional specific nutrients to provide a healthy teeth and gums, as well as a food cooler. - Opti Digest: FOS & MOS ensure a healthy intestinal flora. - Opti Care: taurine keeps heart function. 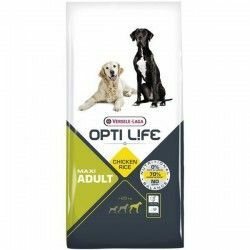 Description: Opti Life Maxi Medium Adult Digestion is a specialized food for the digestive system sensitive of your dog. Opti Life Adult Digestion Medium & Maxi is a formula perfectly balanced, specially developed to meet all the nutritional needs of your dog if you have a sensitive digestive system.